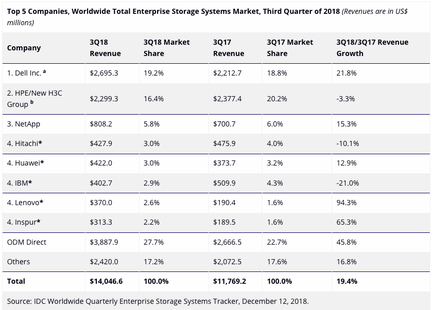 Vendor revenue in the worldwide enterprise storage systems market reached US$14 billion during the third quarter of 2018, representing an increase of 19.4 per cent year-over-year. According to IDC findings, total capacity shipments were up 57.3 per cent year-over-year to 113.9 exabytes during the quarter. 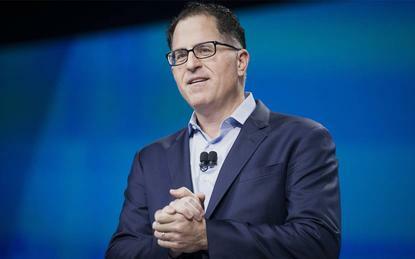 Of note to the channel, Dell Technologies ranked as the largest supplier for the quarter, accounting for 19.2 per cent of total worldwide enterprise storage systems revenue and growing 21.8 per cent year-over-year. Hewlett Packard Enterprise, alongside the new H3C group, came in as the second largest supplier with 16.4 per cent share of revenue on a year-over-year decline of 3.3 per cent. This was followed by NetApp, which generated a 5.8 per cent share of total revenue, making it the third largest vendor during the quarter following 15.3 per cent growth year-over-year. Further down the list, Hitachi, Huawei, IBM, Lenovo and Inspur were all “statistically tied” for the number four position with shares of three per cent, three per cent, 2.9 per cent, 2.6 per cent, and 2.2 per cent respectively. As a single group, storage systems sales by original design manufacturers (ODMs) directly to hyper-scale data centre customers accounted for 27.7 per cent of global spending during the quarter and grew revenue by 45.8 per cent against 3Q17. “The third quarter results show a continuation of growth realised through the first half of 2018, driven by an ongoing infrastructure refresh cycle, investments in resource intensive next-generation workloads, and expanded use in public cloud services," said Sebastian Lagana, research manager at IDC. Lagana said revenue generated by the group of ODMs selling directly to hyper-scale data centres increased 45.8 per cent year-over-year to US$3.9 billion during the quarter, representing 27.7 per cent of total enterprise storage investments during the period. Furthermore, sales of server-based storage increased 10.1 per cent year-over-year to US$3.8 billion in revenue, accounting for 27.3 per cent of total enterprise storage investments. 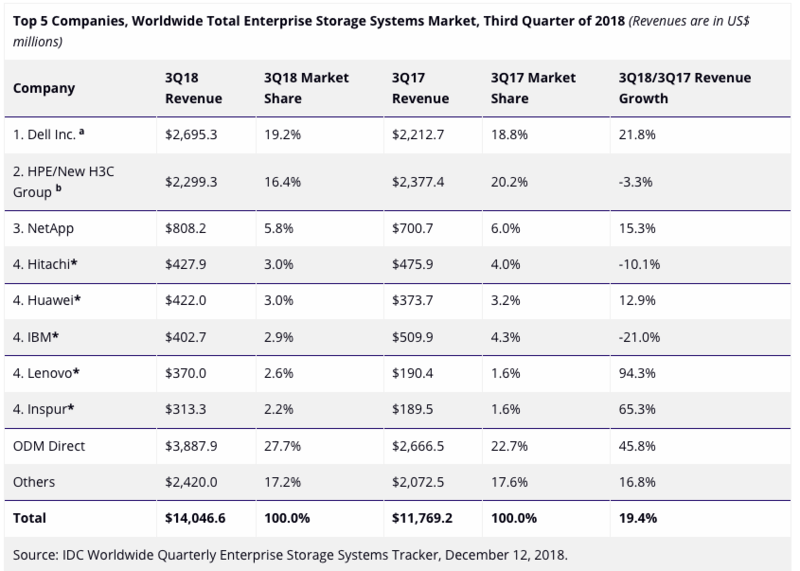 The external storage systems market was worth roughly US$6.3 billion during the quarter, up 12.5 per cent from 3Q17.